Today, industrial usage of Carbon Fiber Reinforced Plastic (CFRP) is steadily increasing, with an amount of 67,000 t/year. Latest products such as the Boeing 787 and Airbus A350 in the aerospace sector, as well as the BMW i3 from the automotive industry, consist of more than 50 percent of CFRP in their structural weight. At the same time these products also have comparatively high production volumes, in the five-digit range per year in the case of the BMW i3. Therefore, a higher degree in automation and cost-efficiency is needed in production. Due to the highly abrasive carbon fibers, conventional machining processes result in short tool life and high costs. For that reason laser cutting of CFRP as a wear-free alternative has become the focus of several research groups. Two different approaches are commonly chosen: Cutting by short- and ultra-short pulsed laser systems to reach a process regime of cold ablation, and cutting with continuous wave (cw) lasers at high cutting speeds. For the latter approach, it has already been shown that by increasing power and cutting speed, the heat affected zone (HAZ) can be reduced due to less time allowed for heat conduction. A new approach presented here uses an ultra-high power fiber laser system of 30 kW to cut CFRP laminates in order to allow for highest-speed and lowest HAZ. The material for the process was chosen to specifications from typical automotive applications of CFRP. 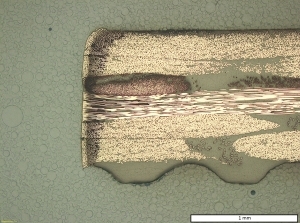 2D specimens were manufactured using vacuum infusion technology, consisting of a total of six layers of non-crimp carbon fabrics and an epoxy resin. A high power Yt:YAG fiber laser was used in combination with a special optical system that can handle the high intensities needed for the experiments. The laser beam was directed to the manufacturing cell in a 300 µm process fiber and then collimated and focused by an optical system with an image scale of 1:1.2 to achieve a theoretical focal diameter of 250 µm. Normally in laser materials processing, relative movement is realized either by movement of the workpiece or the beam with the means of a linear axis, or alternatively by scanner systems. Commercially available scanner systems operate already with comparably high feed rates of several m/s. In order to allow for a detailed investigation on the influence of the number of passes in a multi-pass cutting strategy, the achievable feed rate should be high enough to enable a cutting process with n ≥ 30 passes at highest possible intensity. Calculations of the required feed rate based on the necessary intensity for the sublimation of the carbon fibers yield a requirement for the relative movement system of 80 m/s, which is not achievable by today’s scanner technology. To achieve these feed rates, a rotary plate was manufactured and turned at high number of revolutions instead. An overview of the setup is given in Figure 1. 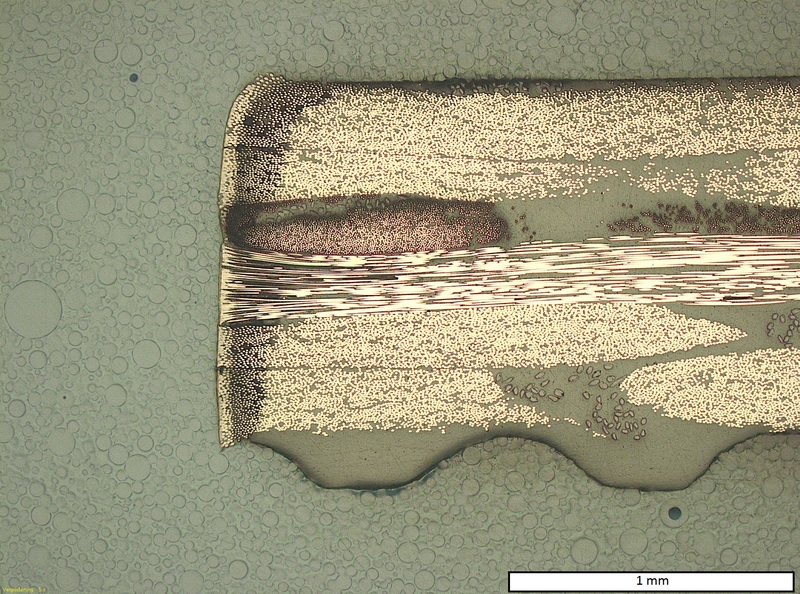 Using 30.5 kW of laser power focused down to a spot of 244 µm in diameter, it was possible to cut a 1.4 mm thick CFRP laminate in a one pass strategy at 1.2 m/s and with a mean HAZ of 139 µm (Figure 2, left). With a multi-pass strategy finding its optimum in a range between 12 to 16 passes, the HAZ was further reduced down to 78 µm at 12 passes (Figure 2, middle), and the energy input needed was reduced by approximately 26 percent. The effective feed rate can be increased up to 1.63 m/s in the multi-pass strategy – 26 m/s per pass – at an optimum 16 passes (Figure 2, above), with the ultra-high power laser system. This makes it an attractive option for industrial applications with high production volumes and medium quality requirements. However, fissures and chipping behavior were observed especially close to the surface of the specimens, probably resulting from high process pressures. It is assumed that this behavior results from an insufficient absorption of the laser wavelength by the matrix, leading to fast energy deposition within the material, and finally to partial evaporation below the surface. Further investigations, e.g., cutting experiments with a laminate including absorbing particles such as carbon-black in the matrix, are needed to prove or disprove this theory. This approach has already proved to be very efficient at comparatively lower laser powers of up to 5 kW, as shown in Figure 3. At the current state, the process can be used to cut several mm of 2D CFRP specimens, Figure 4. By using a programmable focusing optic as well as modified exposure strategies such as parallel lines, laminates thicker than 10 mm can be cut with a maximum HAZ of 230 µm as well. The authors work for the Institute of Laser and System Technologies, Hamburg University of Technology, Hamburg, Germany. Part of this work was supported by the German Federal Ministry for Economic Affairs and Energy (BMWi) within the frame of the project 01 MX 12049. The authors would like to thank BMWi as well as PT-DLR project management agency for their support.Furthermore, the authors express their gratitude to Precitec Optronik GmbH for providing the optical system, and Rhein Composite GmbH for providing the carbon fiber fabrics.